Whenever I teach social media courses to salon owners, the bit where they get the most animated and have the most 🎆a-ha🎆 moments is the section when we look at examples of other salons’ social media posts and discuss what worked and what opportunities were missed. And when I saw this rather brilliantly composed Tweet by @Stuart_Holmes I wanted to share it and shout about why it works so well. 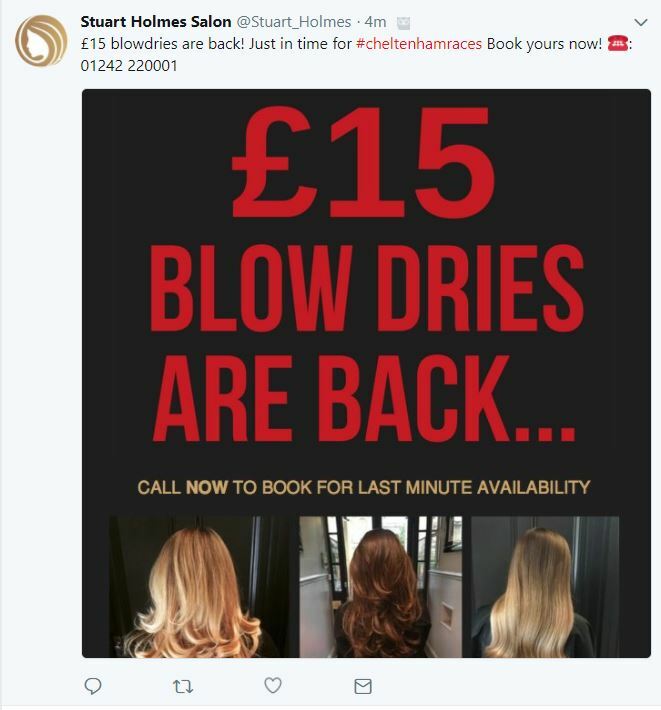 So here it is… the first post in a brave new series where I’m going to be cherry-picking the best examples of salons’ social media usage and revealing why it gets my thumbs up. It’s a very simple offer that everyone can understand and targets current clients and potential new clients. 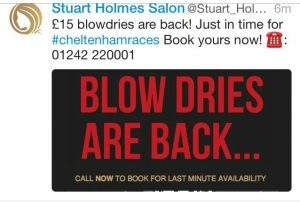 Great use of a local and relevant hashtag #cheltenhamraces – This is a hashtag that people WILL actually use over the coming weeks, rather than a hashtag that the salon would like people to use. There’s a clear call to action – PHONE US NOW! If I was being hyper critical I’d say that many of their other posts have stronger imagery. Also, when you post an image on your desktop you need to remember that the mobile feed crops the images to 440px x 220px so you must get the most important, most eye catching bits in that middle window.